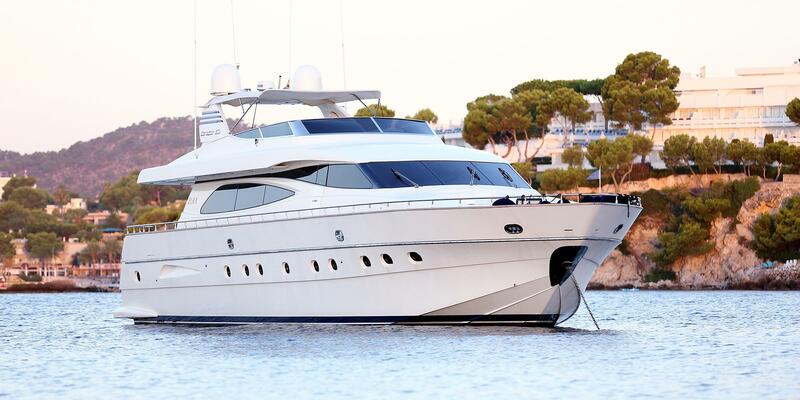 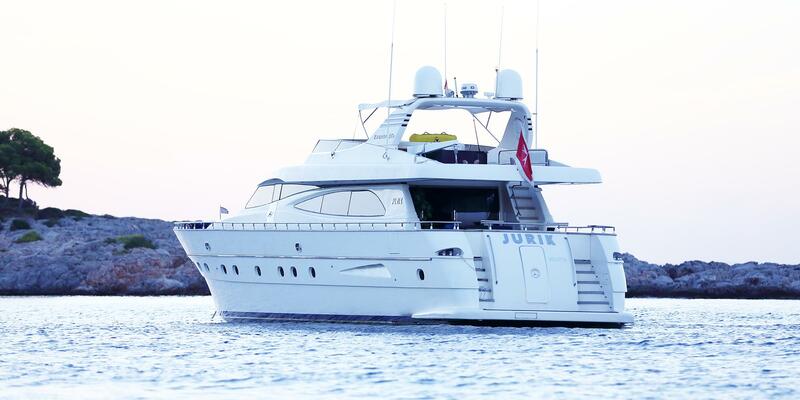 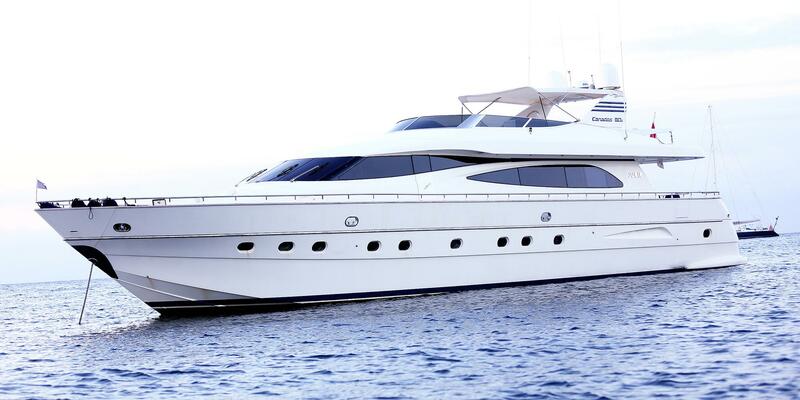 Motor yacht JURIK is a 25.35m (83' 2") luxury vessel built by Canados and launched in 2003. 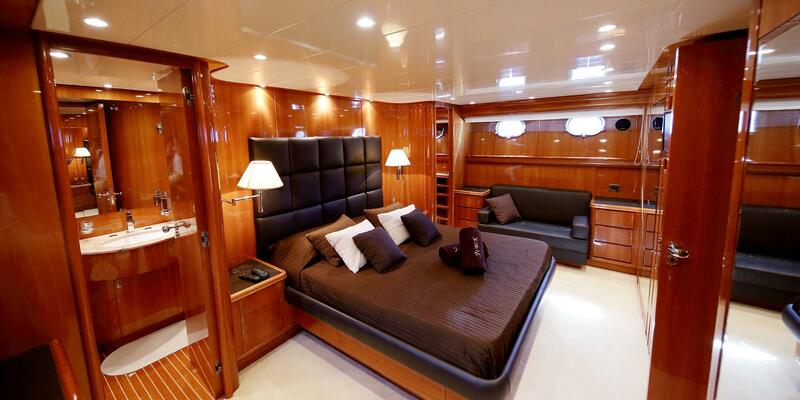 She was refitted in 2014 and offers accommodation for up to 9 guests over a four-cabin layout. 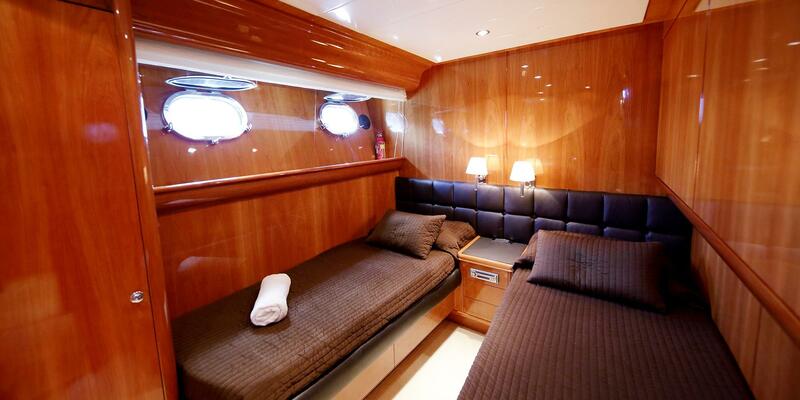 There is a crew of three on board. 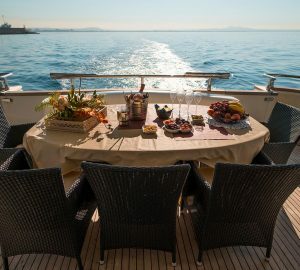 From the swim platform, guests have direct access to the main deck aft via two staircases, and the stern is fitted with a spongy sofa and a raised dining table with five additional chairs to seat eight altogether. 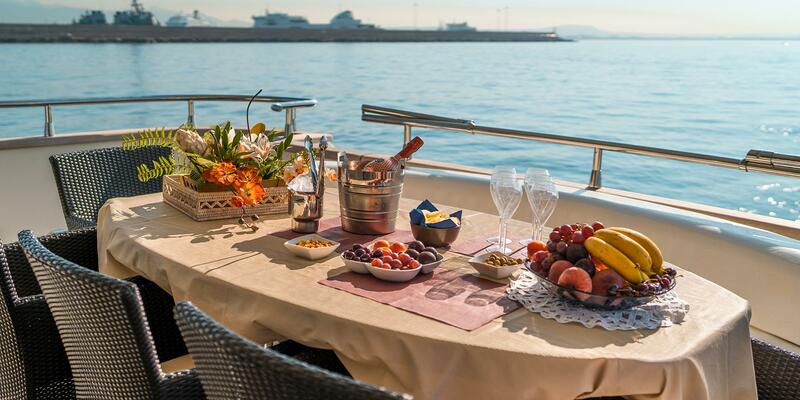 After a meal, the double sun pad on the foredeck is the perfect place to relax in the sunshine or alternatively, guests can access the flybridge via the starboard aft staircase. 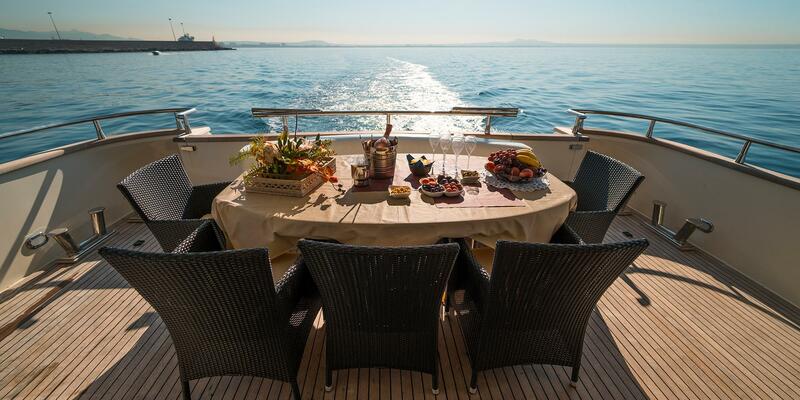 The flybridge presents guests with a port sun pad behind the helm station and to starboard beneath the hardtop there is an L-shaped sofa and dining table for casual meals. 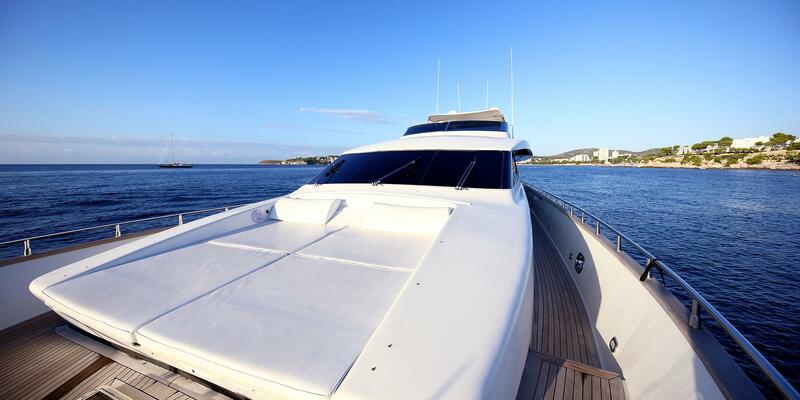 To the aft section is used for storing the tender, which is launched and retrieved using the Davit crane. 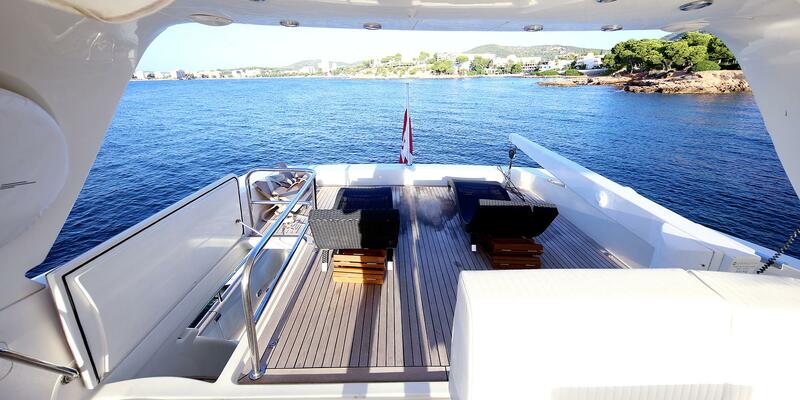 However, when space is clear, a pair of sun loungers can be laid out for an additional place to take in the scenic location. 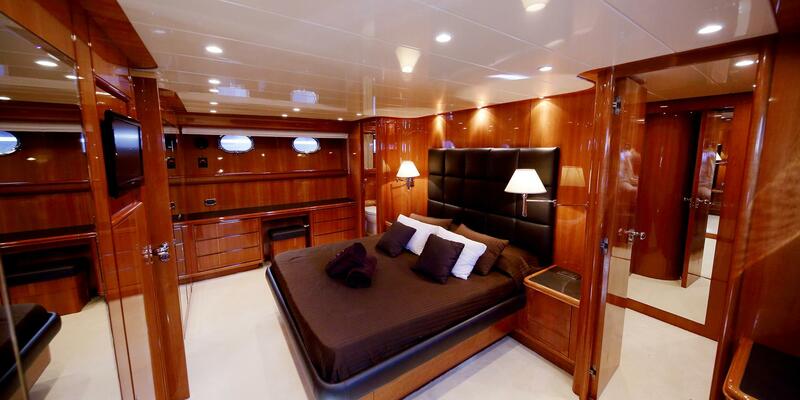 The interior styling creates a sophisticated ambiance using dark wood paneling with rich undertones to complement the furnishings and upholstery in chocolate and pure white. 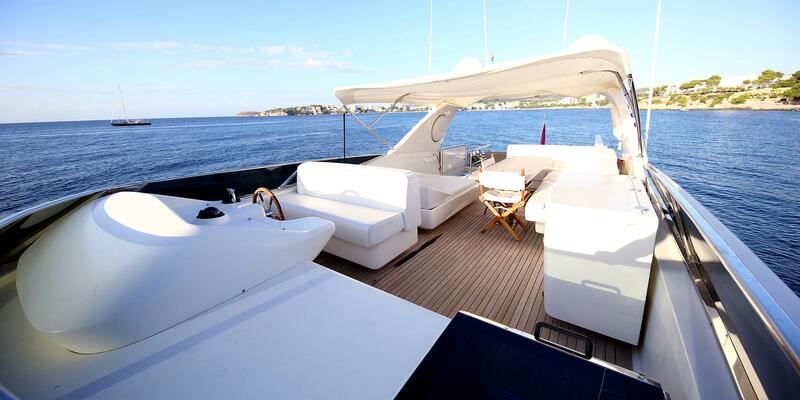 The minimalist interiors make excellent use of the space while ensuring guests have plenty of room for hosting parties and relaxing in peace and quiet. 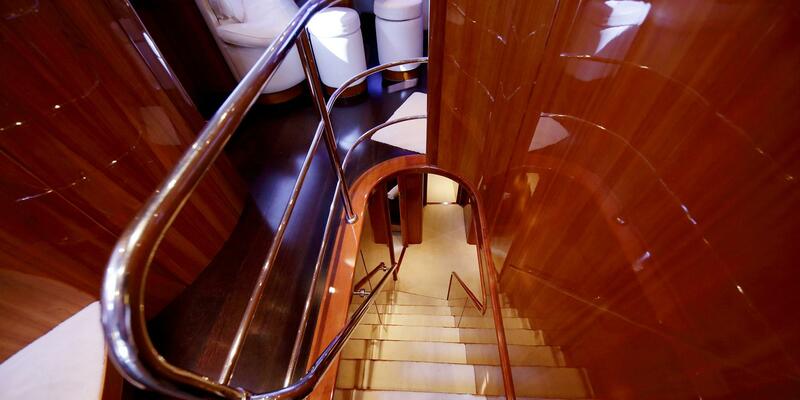 On the lower deck guests are treated to four spacious cabins consisting of a Master suite, a VIP stateroom and two twin cabins that each have a Pullman berth. 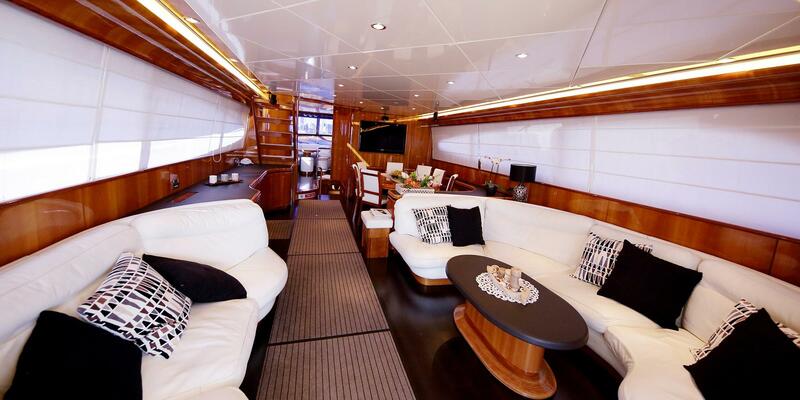 The main deck interior contains a cozy C-shaped seating area with a drinks table beside the helm station and adjacent to the stairs to the lower deck. Behind, the open-plan interior enjoys plenty of daylight from the broad windows panning both sides of the room. 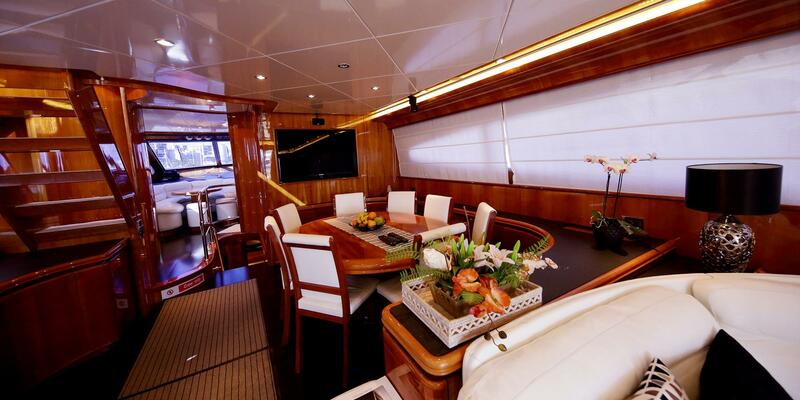 The starboard formal dining area is placed forward and the circular setting offers eight comfortable chairs around a large table, while a widescreen TV is mounted on the forward wall. 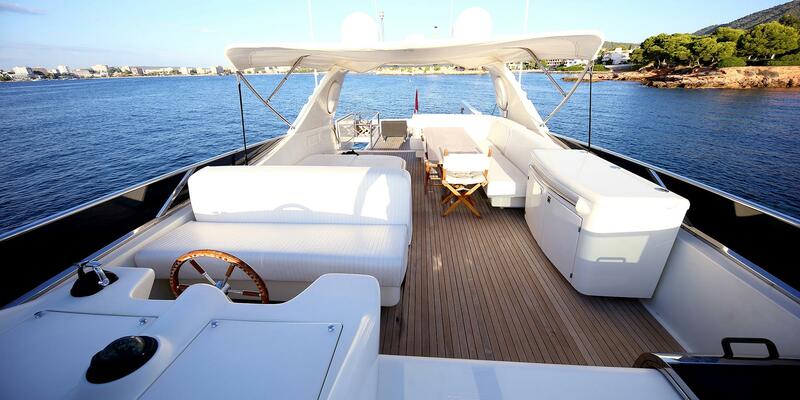 Farther aft is two C-shaped sofas and a drinks table accompanies the starboard settee. 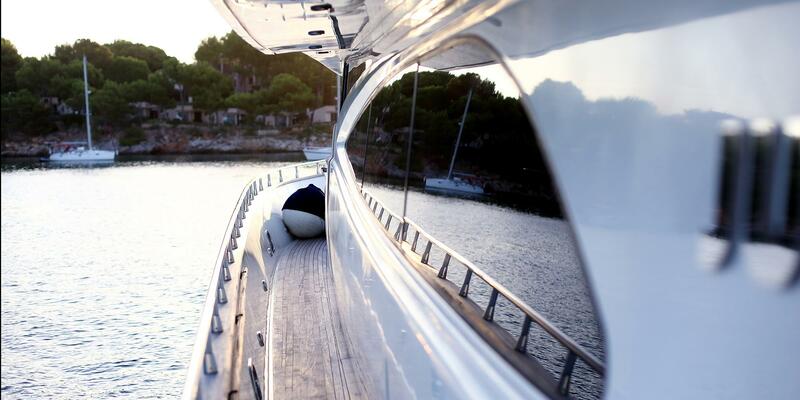 Twin MAN 1,550 HP engines produce a maximum speed of 28 knots and a cruising speed of 22 knots. 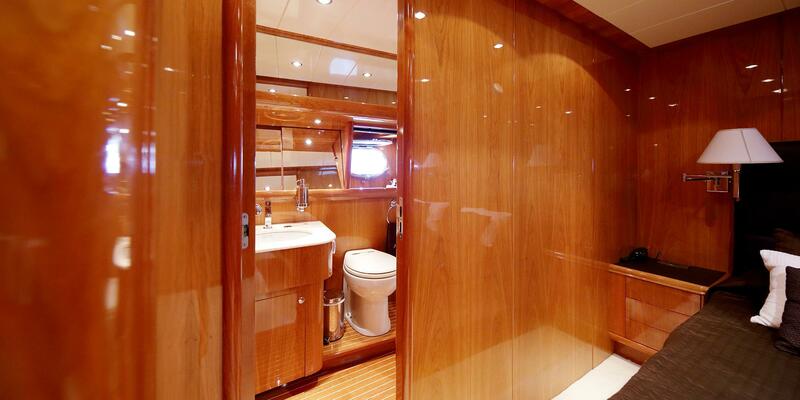 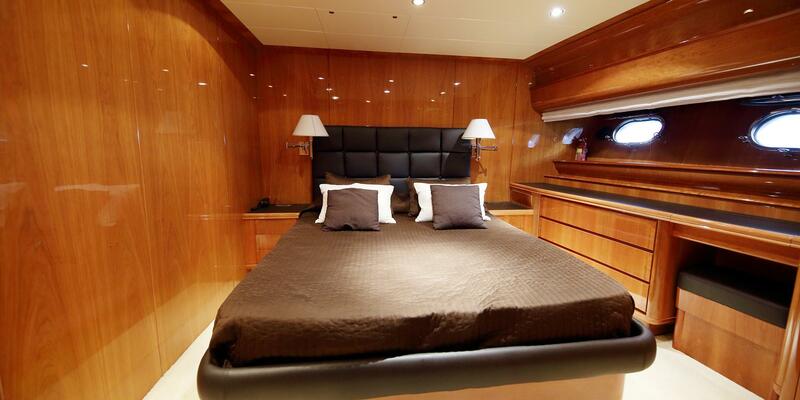 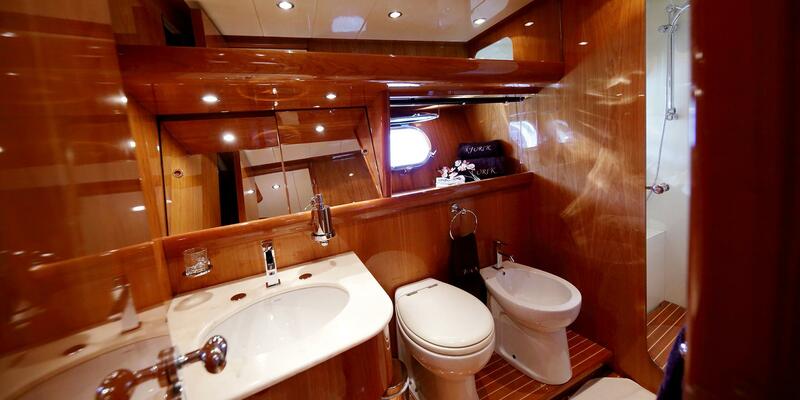 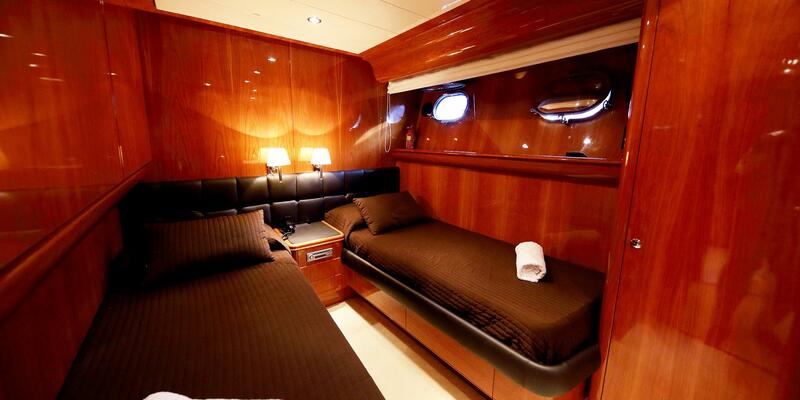 Maximum of nine guests can be accommodated over four luxury cabins on board with ensuite facilities each.